Wass ketne! Let’s get together – the Documentation and Cultural Centre of German Sinti and Roma is a place of encounter and dialogue in the middle of the historic quarter of Heidelberg. The rich culture of the Sinti and Roma comes alive here. Literature, painting, music – the cultural contributions of the minority are as diverse as the people themselves. These contributions are presented in a series of events organised by the Centre – lectures, exhibitions, film screenings, concerts and excursions – and in successful cooperation with such partners like the Kulturhaus Karlstorbahnhof cultural centre. In addition to this, the Centre is a place of remembrance of the victims of the National Socialists. In particular, the only permanent exhibition of its kind allows visitors to engage with and reappraise the Holocaust of the Sinti and Roma. This makes the Centre an important museum of contemporary history and a place of historical memory. Therefore, one of its principal tasks is to document the history of the Sinti and Roma in Germany and in Europe – a history spanning more than 600 years. A special emphasis is placed on the National Socialist crime of genocide that has been suppressed from public consciousness for decades. Interviews with Holocaust survivors, audio and video recordings of their memories, and research in archives in and outside of Germany have priority here. Furthermore, the Centre systematically collects personal testimonies of survivors and their relatives. In this, old family photographs are of particular interest. By this time, this work has given rise to an archive that is unique. Human rights have always been the centre of attention. As a forum for minorities, anyone who is a victim of discrimination and violence will be given a voice here. In view of our own persecution under National Socialism, we have a special obligation to provide a place for critical debate on current socio-political developments and to place more strong emphasis on anti-racism work, education and pedagogical work. With the support of the city of Heidelberg, the Centre was founded in the historic quarter of Heidelberg at the beginning of the 1990s. 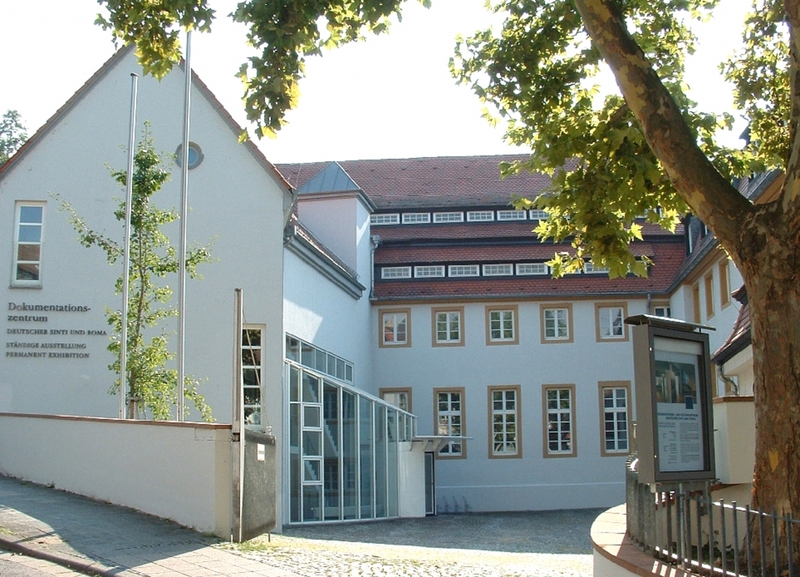 Together with the Central Council of German Sinti and Roma, the Documentation Centre is the central institution of the minority in Germany. The Documentation Centre and the Central Council act independently of each other and are legally separate associations. However, they work closely together. A unique institution in Europe, the Centre is supported institutionally by the Federal Government of Germany and the Federal State of Baden-Württemberg. After several years of conversion and extension work, the complex containing the world’s first permanent exhibition on the Holocaust of the Sinti and Roma was ceremonially opened to the public on 16 March 1997.